The Prominend concept consists of a palatable UHT milk in a liquid format with a long shelf life due to advanced production technology. 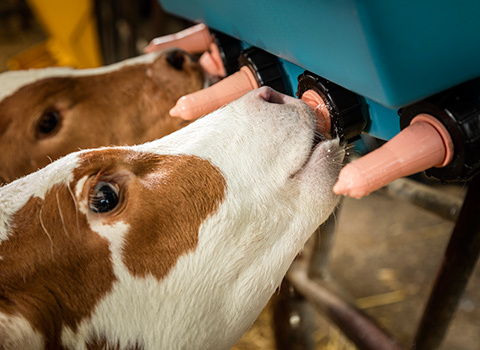 In combination with an ad libitum feed application, this concept promises modern farmers vital calves, increased labour convenience and improved return on investment. The Prominend liquid products are a palatable UHT milk – uniquely delivered as a liquid – and based on food-grade dairy ingredients to ensure the highest protein quality and thus a highly digestible product. In addition, it provides calves with the enriched nutrition they need, resulting in vital calves with a high growth rate. The product has an exceptionally long shelf life of 12 months unopened and eight weeks opened. Since the product is provided as a liquid, it is easy to dilute with water which excludes clumping. 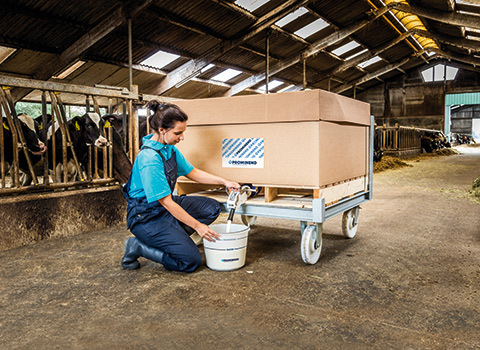 Furthermore, measuring the amount of water and milk with the Prominend bucket reduces the risk of procedural errors. Just fill the bucket with water up to the water line and add the milk up to the Prominend line. The liquid products can be fed ad libitum which guarantees a gradual feed intake with smaller portions per feeding. Spreading the milk intake leads to more feedings per day with a lower amount per portion. This improves feed intake and digestion, resulting in a higher daily gain. The product can also be fed cold within flexible feeding times, or given warm without a strict temperature, which guarantees ease of labour. The Prominend teat is designed and developed to stimulates the flow of the salvia, which increases the amount of enzymes in the stomach to improve the oesophageal slot response. Improves the oesophageal slot response.